in upscale mountain lake neighborhood. (C)Copyright 2003-2010 Home Architect, PLLC, All Rights Reserved Worldwide. Adirondack Dream designed by HOME ARCHITECTS. HOME ARCHITECTS ® functioned as an Adirondack architect for this unique house. What makes it Adirondack is the rustic flavor. The log posts are almost Hobbit-like, full of gnarled whorls and bifurcations. The drive-through porte-cochere is at an interesting angle to the main house. This angle was devised by Soellner to align the people entering with the primary view, across the hearth room, and on out to the mountain in the Panthertown rugged area beyond the large glass doors. The goal of the Adirondack architect was to connect the people inside the house with the spectacular outside and never lose sight of that. In these parts, it is all about the view and this architect kept a strong focus on that philosophy. Adirondack architect Soellner really enjoys his role in the creation of these rustically elegant mountain houses. In this one, he used timber joists and beams for the roof structure and log girders (see porch roof structure above). Soellner’s posts are also log. While there are plenty of logs involved, Soellner really doesn’t label this as a log residence. He calls it Adirondack because of the rustic nature and post and beam and timber frame characteristics. This residential project was built and sold by the developer. It has 3BR, 3-1/2 Baths, 2 Car Porte-Cochere. Stone stairway pop-out on Adirondack house. (C)Copyright 2003-2010 Rand Soellner, Adirondack architect. Adirondack architect Soellner uses native stone on stair. Adirondack architect Rand Soellner used native stone on stair tower, cedar shingles on walls and timber roof joists. 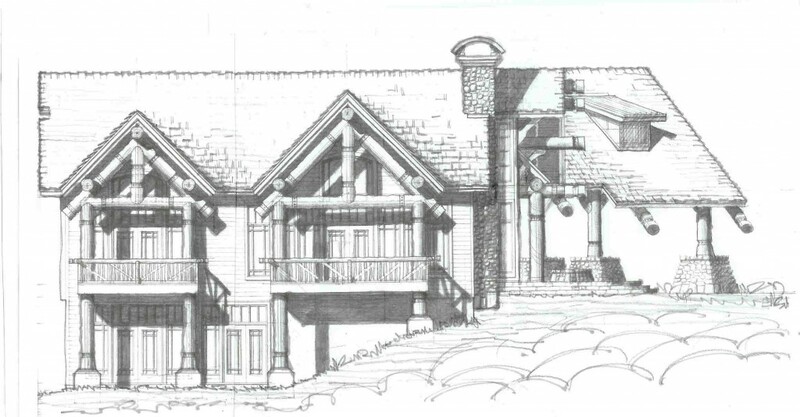 Even the porte-cochere is timber frame, with 2 roof dormers to admit light in the center of the driveway. In the Foyer, there is an elegant Powder Room to the right and to the left, a Wine Room. The open plan Kitchen is after that, with a 42″ bar-counter-buffet open to the breakfast room and the Hearth Room. The Master Suite is after that, with an Outdoor Sleeping Porch. Downstairs, there are 2 guest suites and a Family Room, with a built-in big screen and fireplace, and outdoor view porch. Adirondack architect Soellner blends various styles, merging Appalachian, which is actually just south of the Adirondacks. What is important to him is that his clients enjoy the designs, regardless of the stylistic techniques utilized. Rand Soellner is a custom home architect used to designing tailormade residences across the United States, with other projects around the planet. Soellner is also a mountain homes architect, among other things. He designs a variety of residential types for flat land as well as steep terrain, in places like Glade Springs in West Virginia, northern Illinois, Tennessee, Clayton Georgia, Greenville South Carolina, Myrtle Beach SC, Miami, Anchorage AK, Canada, Germany, Russia, Japan, Honduras, Texas Hill Country, Houston, San Antonio, Denver, Tacoma Washington, South Bend Indiana, and many other places.